Revenue in the Bread & Bakery Products segment amounts to US$464,080m in 2019. The market is expected to grow annually by 4.1% (CAGR 2019-2023). In global comparison, most revenue is generated in United States (US$70,057m in 2019). In relation to total population figures, per person revenues of US$63.05 are generated in 2019. The average per capita consumption stands at 16.9 kg in 2019. The Bread and Bakery Products market includes fresh bread and bread rolls and similar baked goods (e.g. pastries) made using grains or cereals. In addition to freshly baked products found in bakeries are baked goods such as cakes, pies and rusks. Cookies (see: Confectionery) and extruded products such as pretzels (see: Snack Products) are not included here. The baked goods market is characterized by a downward trend in terms of volume demand in most markets due to changes in eating habits and food trends. Despite increasing concentration of manufacturers, this industry is still dominated by a variety of more regionally important small and medium enterprises. Reading Support Revenue in the Bread & Bakery Products segment amounts to US$464,080m in 2019. Reading Support The Bread & Bakery Products segment is expected to show a revenue growth of 5.0% in 2020. Reading Support The average revenue per person in the market for Bread & Bakery Products amounts to US$63.05 in 2019. Reading Support In the market for Bread & Bakery Products, volume is expected to amount to 132,697.5 mkg by 2023. 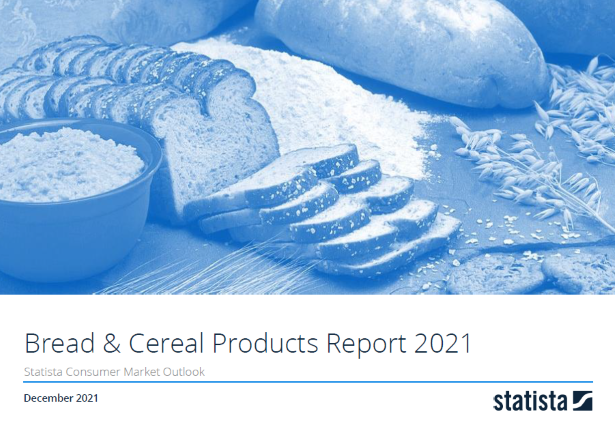 Reading Support The market for Bread & Bakery Products is expected to show a volume growth of 1.6% in 2020. Reading Support The average volume per person in the market for Bread & Bakery Products amounts to 16.9 kg in 2019. Reading Support The average price per unit in the market for Bread & Bakery Products amounts to US$3.73 in 2019. Reading Support With a market volume of US$70,057m in 2019, most revenue is generated in United States. Here you can find more studies and statistics about "Bread & Bakery Products".